The goal of this project is to work alongside the governments and communities of small island states to enhance their resilience to climate change by protecting, restoring, and managing marine and coastal ecosystems and strengthening local capacity for adaptation. Across the islands of the Eastern Caribbean, climate change already places intense pressure on human livelihoods and coastal and marine resources. Small islands states contribute very little to global climate change in terms of greenhouse gas emissions. Yet, these nations are the most vulnerable to the impacts from climate change due to their high coastal population densities, limited land space, geographic isolation, scarce freshwater supplies, and significant dependence on tourism and fisheries. These islands now face significant threats from increases in severe storm events, flooding, coastal erosion, drought, saltwater intrusion of coastal aquifers, and bleaching of coral reefs. Island nations currently use a range of engineered solutions to respond to climate change, (e.g. constructing sea walls, levees, dams and river bank hardening). Although traditional infrastructure is sometimes necessary, it is costly and often destroys natural systems that island residents rely upon for basic services and quality of life, such as food, coastal protection, recreation, water security, and livelihoods. In the Eastern Caribbean, we have worked with the government and people of Grenada and St. Vincent and the Grenadines for more than a decade, helping strengthen national parks and protected area systems and developing sustainable finance and human capacity for effective environmental management. The At the Water’s Edge (AWE) project builds on these experiences and partnerships to develop, test, and implement ecosystem-based adaptation (EBA) strategies which enhance communities’ resilience, while protecting natural environments. Our Goal is to demonstrate that governments and communities of small island states can enhance their resilience to climate change by protecting, restoring and effectively managing their marine and coastal ecosystems, and strengthening local capacity for adaptation. Approximately 200,000 people inhabit the island nations that make up the Grenadine Bank – 93,000 in Grenada and 105,000 in St. Vincent and the Grenadines – with 85% of the people concentrated on a narrow coastal strip less than 5 meters above sea level. These two countries are dependent on limited natural resources to support their primary economic sectors: tourism, agriculture, and fishing. Like other small island nations in the Eastern Caribbean and beyond, the Grenadine Bank is on the front lines of climate change. Already they are experiencing hotter temperatures, more frequent and intense storms, flooding, rising sea level, and degraded coral reefs, which in turn threaten lives, property, food, fresh water, livelihoods, and overall economic stability. Faced with these urgent matters, decision makers need to make investments that will save lives today and improve livelihoods into the future. The Fisherman’s Story tells the story of fishermen and climate change on Grenada and St. Vincent and the Grenadines. These small island states are vulnerable to even the smallest of storm surges, and are witnessing erosion and loss of natural habitat every day. In the past, healthy corals, and mangroves reduced wave energy before they reached the beaches, providing a natural barrier for communities and important coastal resources. With the reefs degraded and the mangroves harvested, the beaches are being eroded, important fisheries habitat have been lost, and coastal infrastructure and people are now more vulnerable to impacts from the sea. These coastal habitats, like mangroves, coral reefs, seagrasses, and beaches, are heavily impacted by coastal hazards but present the greatest potential to provide protection. 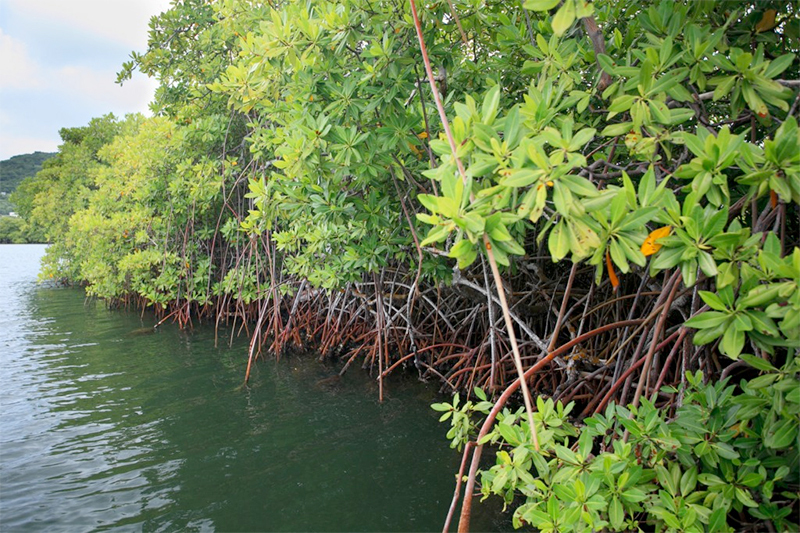 Mangroves act as a buffer from storms and flooding by absorbing impacts from waves, guarding against coastal erosion, and providing critical fish habitat. Coral reefs buffer the shoreline from waves thus decreasing potential for land based erosion and flooding. Seagrass beds trap sand and sediments in coastal bays, working with reefs to attenuate waves. Beach dunes act as barriers to storms and anchor coastal ecosystems. With technical support from The Nature Conservancy, governments and communities in the Grenadine Bank have a better understanding of the connections between natural habitats (like mangroves, reefs, and vegetated shorelines) and their ability to protect lives, property, and livelihoods. With partners and expert input from the Conservancy, the tourism industry, government, coastal engineers, landscape architects, and habitat restoration experts, the community members created action plans for sites in Union Island and Grenville that include short, medium, and long-term actions. Solutions are realistic, directly benefit communities, and include nature-based elements, like the creation of a living shoreline. These “Living Edges” integrate engineered structures with mangrove plantings to protect the shoreline livelihoods, critical infrastructure and cultural interest. Proposed solutions are designed to help the communities prosper while adapting to climate change and reducing disaster and climate risk impacts. Integrating nature into climate and disaster reduction planning presents new challenges. The At the Water’s Edge (AWE) project builds capacity at all levels (local, national, and regional) and trains decision-makers in using and understanding new information about risk reduction strategies. At the national and regional level, the AWE project works with agencies and partners like the International Federation of Red Cross to develop trainings on the role of nature in risk reduction. At the local level, the AWE project fosters a new generation of leaders through targeted workshops and trainings, as well as participatory mapping activities. To date these activities have trained over 85 persons. Under the guidance of the Conservancy and a commercial dive company, a team of local divers from the communities installed submerged pilot breakwaters structures upon the reefs within the northern bay of Grenville. To use an eco-engineering approach to reduce the coastal erosion and storm related salt water flooding affecting the Grenville and Telescope area in the northern section of Grenville Bay, Grenada. To restore the wave-breaking function of the degraded reefs in northern Grenville Bay and to facilitate the reestablishment of coral growth and ecological functions in the Bay. To demonstrate the feasibility of a new eco-engineered submerged breakwater design that can be installed utilizing local community labor, at lower cost and with higher ecosystem benefits than traditional grey infrastructure such as seawalls, rip rap, and groins. For more information on this pilot project, please see this factsheet. The At the Water’s Edge project works with the residents of Ashton Lagoon, Union Island through local partner Sustainable Grenadines Inc. (SusGren) to restore one of the largest ecosystems in the Grenadines, to improve mangrove habitat, coral reefs, seagrass beds and fish life whilst providing opportunities for sustainable livelihood and development. Please visit At the Water’s Edge for the latest reports, publications, and other resources on Grenada, St. Vincent, and the Grenadines Coastal Resilience. Click HERE to learn more about the TNC and Red Cross partnership in Grenada. Read about our team’s systematic approach to assess the protective role of coral reefs and the reef’s influence on wave propagation patters: Coral reefs for coastal protection: A new methodological approach and engineering case study in Grenada. A new study from the University of California-Santa Cruz and The Nature Conservancy shows that the loss of coral reefs – these natural shoreline defenses — leads to severe coastal impacts. The study, published in the Journal of Environmental Management, demonstrates that the degradation of reefs in Grenville Bay, Grenada, is instrinsically linked to the coastal erosion and flooding in surrounding communities. TNC’s partnership with the Red Cross in Grenada has led to a change in the way the both organizations assesses risk and design adaptation solutions. In March 2017, The At the Water’s Edge Project hosted Reef Week, a week of awareness activities to educate the communities within the project site about coastal resilience. This animated video uses drone and drop-camera footage to model one of the piloted reef structures in Grenville Bay, Grenada.